The Rachel Carson Trail is a hiking trail north and east of Pittsburgh, Pennsylvania, spanning 45.0 miles (72.4 kilometers) between Harrison Hills County Park in the extreme northeast corner of Allegheny County, and North Park in the north-central area of the county. The trail is extremely varied, traversing several county parks, following power and gas lines, skirting suburban homes and farms, crossing creeks, meandering through woods and fields, and passing along the edge of steep bluffs. The terrain along the route ranges from paved roads to some areas that are quite primitive and rugged. A spur connects to the mansion area at Hartwood Acres County Park in Indiana Township, and the trail passes in front of the Rachel Carson Homestead in Springdale. Continuing urban development along the route of the trail brings disruption and requires rerouting from time to time. There are no camps or shelters along the way, meaning the trail is intended for day hiking. The trail is relatively primitive and steep in places. Few bridges have been built, so many streams have to be crossed as-is. Note: The trail route is subject to change; always follow the yellow blazes. Be courteous to people living along the trail. Remember, you are generally on private property. Respect the land and its owners. If asked to leave, do so. Do not camp or build fires along the trail. Refrain from bringing dogs and bicycles on the trail. Keep off the trail with motorized vehicles. Carry out your own trash; help by picking up others’ litter. Recognize your limitations and your assumed risk. The Rachel Carson Trails Conservancy and the landowners want you to enjoy your hike; neither will take responsibility for personal injury or losses while using the trail. The Marian Crossman bridge over Wexford Run is now open, completing the 6.8-mile westward extension of the trail and connecting it to the Harmony Trail. (27 October 2018). In North Park on 9/27/18 and 9/28/18, all the North Ridge trails between the skating rink and the spillway will be closed for a film shoot. (21 September 2018). Gas well development above Emmerling Park has forced a minor relocation of the trail around the site perimeter fence next to Cove Run Road. The new route has been blazed and temporary signs are in place. (5 October 2017). There are new "No Trespassing" signs posted around the Springdale coal ash site, but Duquesne Light says these are not intended for Rachel Carson Trail users. (21 September 2017). The replacement of the road bridge on Church Lane near Wagner Road is complete and the trail is no longer rerouted. (2 June 2017). The road bridge on Church Lane near Wagner Road is being replaced. Follow the yellow flagging tape off the road and across Shafer Run. (30 April 2017). Between Route 910 and Saxonburg Boulevard, logging for the turnpike widening has disrupted the route of the trail. Follow the yellow flagging tape through here. (9 March 2017). Westbound from Saxonburg Blvd., immediately after crossing the bridge over Deer Creek, follow the blazes which will turn right down the embankment, across the field, across Cedar Run on stepping stones, along Deer Creek, then up the hill and into the woods. You'll emerge on Route 910 and turn left, over the turnpike bridge, down to Cedar Run Road where you'll turn right. Eastbound upon reaching Route 910 at the end of Cedar Run Rd., follow the blazes left and up Route 910 over the turnpike until you come to a power line clearing. Turn right onto the clearing, continuing to follow the blazes to Saxonburg Blvd. where you'll turn left on the bridge over Deer Creek. Westbound from Emmerling Park at Cove Run Road, follow Cove Run Road to the left for about 0.25 mile. Turn left onto a township road for a short distance then bear right and up a short hill to Route 910. Turn right onto the berm of Route 910 and follow Route 910 for about one mile to the intersection with Saxonburg Blvd. At the traffic light, turn right and walk along the berm of Saxonburg Blvd. for approximately 100 feet to rejoin the Rachel Carson Trail on the opposite side, over the guardrail. Eastbound, upon reaching Saxonburg Blvd, turn right, then left at the traffic light on to Route 910 and follow it for about one mile. A short distance after passing Emerling Plaza, turn left and descend down a short hill to a township road. Bear left on the township road then right onto Cove Run Road, continuing past the entrance and main parking lot for Emerling Park. Turn right at the gravel parking area to rejoin the Rachel Carson Trail where it enters Emerling Park over the footbridge. Westbound from Freeport Road, follow the utility corridor until you reach the chain link fence of the Springdale High athletic field and turn left (this is also the Rachel Carson Homestead spur trail). When you reach the road (Butler Street), bear right, then left on Marion Avenue. Follow it until it ends and enter the woods. Eastbound, after crossing Tawney Run Road, turn right before crossing the run and follow the old railbed. Presently the trail is in good shape; it's clear and well-blazed. Volunteer work crews address problem areas in the spring. If you encounter any difficulties with trail conditions, blazing, or landowners, please email us at info@rachelcarsontrails.org. The Conservancy endeavors to keep the trail off paved roads as much as possible, and occasionally explores route changes to this end. About 27% of the trail, or 9.5 miles, is along roads. Most of these are lightly travelled, but some carry fast-moving traffic and have dangerous curves. Please use extreme caution at all times. Yield for traffic and never assume drivers can see you. 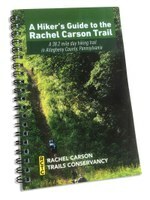 A printed guide to the Rachel Carson Trail is available for purchase. The guide includes a trail history, parking locations, suggested hikes, topographic maps, an elevation profile, and more. The guide may be ordered at our store. From Pittsburgh, take I279 North to the McKnight Road exit and travel 13.4 miles north. Turn left into the Brooktree Center office complex (Wendy's restaurant is on the opposite side) and follow the road 0.3 miles to the Pittsburgh North Regional Chamber of Commerce building. Park on the far end of the lot, away from the building. The trailhead is reached by walking past the dumpster to the trail in the woods (alternatively, there is a large wooden sign on the road next to the trail). Follow the blazes in the woods down to Wexford Run, 0.25 miles. Cross the run on the Marian Crossman bridge to find the trailhead at the junction with the Harmony Trail. From Pittsburgh/northeast, take Route 28 to exit 16, turn east (right if exiting northbound) at the end of the ramp onto Millerstown Road and follow it to the T intersection with Freeport Road. There is a parking area on the left at this intersection for at least three cars. The trailhead is directly across Freeport Road. In 1950, the Baker Trail - a hiking trail extending from the Highland Park Bridge in Pittsburgh to Cook Forest State Park - was dedicated by the Pittsburgh Council of the American Youth Hostels. After several years, the 25 miles within Allegheny County were abandoned largely due to development. 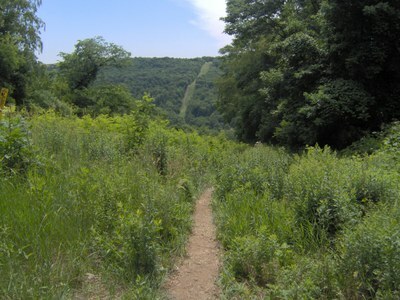 During the years 1972 to 1975, dedicated hikers scouted and rebuilt much of the former trail following the bluffs of the Allegheny River from Harrison Hills County Park to Springdale and then turned west past Hartwood Acres and on to North Park. Because the trail passes close by the birthplace in Springdale of Rachel Carson, one of the early ecologists, the trail was dedicated in her name. The Rachel Carson Trail was completed in February 1975. See the February 1975 map of the trail here (187kB, PDF format). Note the absence of the Allegheny Valley Expressway. Read an October 1973 article about the Allegheny Expressway from the now-defunct Pittsburgh Press here (517kB, PDF format). The Allegheny Valley Expressway is today known as Route 28, and Freeport Road is old Route 28.